هذه المقالة تحتوي على كتابة منغولية. بدون دعم العرض المناصب، فقد ترى علامات استفهام، مربعات، أو رموز أخرى بدلاً من نص بالكتابة المنغولية. اللغة المنغولية (بالكتابة المنغولية: ، Mongɣol kele؛ بالسيريلية المنغولية: Монгол хэл، Mongol khel) هي اللغة الرسمية لمنغوليا وأكبر عضو معروف في عائلة اللغات المنغولية. عدد المتكلمين بها بكل اللهجات قد يصل 10 مليون شخص، بما فيهم الغالبية العظمى لسكان منغوليا والعديد من السكان المنغول في منغوليا الداخلية، المنطقة الذاتية. في منغوليا، فإن لهجة الخالخا، المكتوبة بالسيريلية (وأحياناً باللاتينية في الشبكات الاجتماعية)، هي السائدة، بينما في منغوليا الداخلية، فإن اللغة، من حيث اللهجات، أكثر تنوعاً وتُكتب بالكتابة المنغولية التقليدية. في النحو، فإن تنويعة المنغولية التي يتم التعامل معها هي منغولية الخالخا القياسية (أي اللغة المكتوبة القياسية كما تُستخدم في التقاليد المكتوبة وفي تدريس النحو)، ولكن الكثير مما يقال يصح قوله عن الخالخا العامية وعن اللهجات المنغولية الأخرى، وخصوصاً چخر. Some classify several other Mongolic languages like Buryat and Oirat as dialects of Mongolian, but this classification is not in line with the current international standard. الكتابة المنغولية و السيريلية المنغولية على تمثال سوخباتر في أولان باتور. Khalkha also has four diphthongs: /ui, ʊi, ɔi, ai/. The following table lists the consonants of Khalkha Mongolian. The consonants enclosed in parentheses occur only in loanwords. Nova N 176 found in Kyrgyzstan. The manuscript (dating to the 12th century Western Liao) is written in the Mongolic Khitan language using cursive Khitan large script. It has 127 leaves and 15,000 characters. Mongolian has been written in a variety of alphabets, making it a language with one of the largest number of scripts used historically. 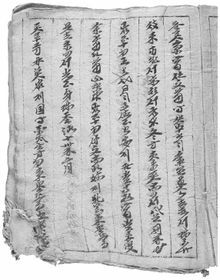 The earliest stages of Mongolian (Xianbei, Wuhuan languages) may have used an indigenous runic script as indicated by Chinese sources. The Khitan large script adopted in 920 CE is an early Mongol (or according to some, para-Mongolic) script. Edict of Yesün Temür Khan, Emperor Taiding of Yuan (1328). Only the 'Phags-pa script retains the complete Middle Mongol vowel system. ^ "Törijn alban josny helnij tuhaj huul'". MongolianLaws.com. 2003-05-15. Retrieved 2009-03-27. The decisions of the council have to be ratified by the government. ^ Svantesson et al. 2005: 25–30. ^ Svantesson et al. 2005: 111. For some Mongolian authors, the Mongolian version of their name is also given in square brackets, e.g., "Harnud [Köke]". Köke is the author's native name. It is a practice common among Mongolian scholars, for purposes of publishing and being cited abroad, to adopt a surname based on one's patronymic, in this example "Harnud"; compare Mongolian name. Some library catalogs write Chinese language titles with each syllable separate, even syllables belonging to a single word. List of abbreviations used. TULIP is in official use by some librarians; the remainder have been contrived for this listing. قالب:Mn icon Amaržargal, B. 1988. BNMAU dah' Mongol helnij nutgijn ajalguuny tol' bichig: halh ajalguu. Ulaanbaatar: ŠUA. Apatóczky, Ákos Bertalan. 2005. On the problem of the subject markers of the Mongolian language. In Wú Xīnyīng, Chén Gānglóng (eds. ), Miànxiàng xīn shìjìde ménggǔxué [The Mongolian studies in the new century : review and prospect]. Běijīng: Mínzú Chūbǎnshè. 334–343. ISBN 7-105-07208-3. (Japanese) Ashimura, Takashi. 2002. Mongorugo jarōto gengo no -lɛː no yōhō ni tsuite. TULIP, 21: 147–200. قالب:Mn icon Bajansan, Ž. and Š. Odontör. 1995. Hel šinžlelijn ner tom"joony züjlčilsen tajlbar toli. Ulaanbaatar. قالب:Mn icon Bayančoγtu. 2002. Qorčin aman ayalγun-u sudulul. Kökeqota: ÖMYSKQ. ISBN 7-81074-391-0. قالب:Mn icon Bjambasan, P. 2001. Mongol helnij ügüjsgeh har'caa ilerhijleh hereglüürüüd. Mongol hel, sojolijn surguul: Erdem šinžilgeenij bičig, 18: 9–20. Bosson, James E. 1964. Modern Mongolian; a primer and reader. Uralic and Altaic series; 38. Bloomington: Indiana University. Brosig, Benjamin. 2009. Depictives and resultatives in Modern Khalkh Mongolian. Hokkaidō gengo bunka kenkyū, 7: 71–101. Chuluu, Ujiyediin. 1998. Studies on Mongolian verb morphology. Dissertation, University of Toronto. قالب:Mn icon Činggeltei. 1999. Odu üj-e-jin mongγul kelen-ü ǰüi. Kökeqota: ÖMAKQ. ISBN 7-204-04593-9. قالب:Mn icon Coloo, Ž. 1988. BNMAU dah' mongol helnij nutgijn ajalguuny tol' bichig: ojrd ajalguu. Ulaanbaatar: ŠUA. (إنگليزية) Djahukyan, Gevork. (1991). Armenian Lexicography. In Franz Josef Hausmann (Ed. ), An International Encyclopedia of Lexicography (pp. 2367–2371). Berlin: Walter de Gruyter. (صينية) [Dobu] Dàobù. 1983. Ménggǔyǔ jiǎnzhì. Běijīng: Mínzú. قالب:Mn icon Garudi. 2002. Dumdadu üy-e-yin mongγul kelen-ü bütüče-yin kelberi-yin sudulul. Kökeqota: ÖMAKQ. Georg, Stefan, Peter A. Michalove, Alexis Manaster Ramer, Paul J. Sidwell. 1999. Telling general linguists about Altaic. Journal of Linguistics, 35: 65–98. Guntsetseg, D. 2008. Differential Object Marking in Mongolian. Working Papers of the SFB 732 Incremental Specification in Context, 1: 53–69. Hammar, Lucia B. 1983. Syntactic and pragmatic options in Mongolian - a study of bol and n'. Ph.D. Thesis. Bloomington: Indiana University. [Köke] Harnud, Huhe. 2003. A Basic Study of Mongolian Prosody. Helsinki: Publications of the Department of Phonetics, University of Helsinki. Series A; 45. Dissertation. ISBN 952-10-1347-8. (Japanese) Hashimoto, Kunihiko. 1993. <-san> no imiron. MKDKH, 43: 49–94. Sapporo: Dō daigaku. (Japanese) Hashimoto, Kunihiko. 2004. Mongorugo no kopyura kōbun no imi no ruikei. Muroran kōdai kiyō, 54: 91–100. Janhunen, Juha. 2003a. Written Mongol. In Janhunen 2003: 30–56. Janhunen, Juha. 2003b. Para-Mongolic. In Janhunen 2003: 391–402. Janhunen, Juha. 2003c. Proto-Mongolic. In Janhunen 2003: 1–29. Janhunen, Juha. 2003d. Mongol dialects. In Janhunen 2003: 177–191. Janhunen, Juha. 2006. Mongolic languages. In K. Brown (ed. ), The encyclopedia of language & linguistics. Amsterdam: Elsevier: 231–234. Johanson, Lars. 1995. On Turkic Converb Clauses. In Martin Haspelmath and Ekkehard König (eds. ), Converbs in cross-linguistic perspective. Berlin: Mouton de Gruyter: 313–347. ISBN 978-3-11-014357-7. (كورية) Kang, Sin Hyen. 2000. Tay.mong.kol.e chem.sa č-uy uy.mi.wa ki.nung. 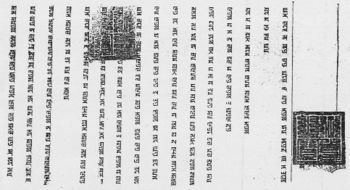 Monggolhak [Mongolian Studies], 10: 1–23. Seoul: Hanʼguk Monggol Hakhoe [Korean Association for Mongolian Studies]. Karlsson, Anastasia Mukhanova. 2005. Rhythm and intonation in Halh Mongolian. Ph.D. Thesis. Lund: Lund University. Series: Travaux de l'Institut de Linguistique de Lund; 46. Lund: Lund University. ISBN 91-974116-9-8. Ko, Seongyeon. 2011. Vowel Contrast and Vowel Harmony Shift in the Mongolic Languages. Language Research, 47.1: 23-43. قالب:Mn icon Luvsanvandan, Š. 1959. Mongol hel ajalguuny učir. Studia Mongolica [Mongolyn sudlal], 1. قالب:Mn icon Luvsanvandan, Š. (ed.). 1987. (Authors: P. Bjambasan, C. Önörbajan, B. Pürev-Očir, Ž. Sanžaa, C. Žančivdorž) Orčin cagijn mongol helnij ügzüjn bajguulalt. Ulaanbaatar: Ardyn bolovsrolyn jaamny surah bičig, setgüülijn negdsen rjedakcijn gazar. (Japanese) Matsuoka, Yūta. 2007. Gendai mongorugo no asupekuto to dōshi no genkaisei. KULIP, 28: 39–68. (Japanese) Mizuno, Masanori. 1995. Gendai mongorugo no jūzokusetsushugo ni okeru kakusentaku. TULIP, 14: 667–680. قالب:Mn icon Mönh-Amgalan, J. 1998. Orčin tsagijn mongol helnij bajmžijn aj. Ulaanbaatar: Moncame. ISBN 99929-951-2-2. قالب:Mn icon Nadmid, Ž. 1967. Mongol hel, tüünij bičgijn tüühen högžlijn tovč tojm. Ulaanbaatar: ŠUA. قالب:Mn icon Norčin et al. (eds.) 1999. Mongγol kelen-ü toli. Kökeqota: ÖMAKQ. ISBN 7-204-03423-6. Okada, Hidehiro. 1984. Mongol chronicles and Chinggisid genealogies. Journal of Asian and African studies, 27: 147–154. قالب:Mn icon Öbür mongγul-un yeke surγaγuli. 2005 . Odu üy-e-yin mongγul kele. Kökeqota: ÖMAKQ. ISBN 7-204-07631-1. Poppe, Nicholas. 1955. Introduction to Mongolian comparative studies. Helsinki: Finno-Ugrian Society. Poppe, Nicholas. 1970. Mongolian language handbook. Washington D.C.: Center for Applied Linguistics. قالب:Mn icon Pürev-Očir, B. 1997. Orčin cagijn mongol helnij ögüülberzüj. Ulaanbaatar: n.a. Rachewiltz, Igor de. 1976. Some Remarks on the Stele of Yisuüngge. In Walter Heissig et al., Tractata Altaica - Denis Sinor, sexagenario optime de rebus altaicis merito dedicata. Wiesbaden: Harrassowitz. pp. 487–508. Rachewiltz, Igor de. 1999. Some reflections on so-called Written Mongolian. In: Helmut Eimer, Michael Hahn, Maria Schetelich, Peter Wyzlic (eds.). Studia Tibetica et Mongolica - Festschrift Manfred Taube. Swisttal-Odendorf: Indica et Tibetica Verlag: 235–246. قالب:Mn icon Rinchen, Byambyn (ed.). 1979. Mongol ard ulsyn ugsaatny sudlal helnij šinžlelijn atlas. Ulaanbaatar: ŠUA. Rybatzki, Volker. 2003. 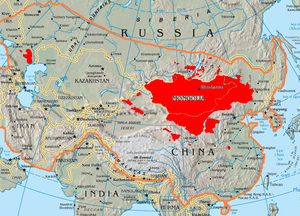 Middle Mongol. In Janhunen 2003: 47–82. قالب:Mn icon Sajto, Kosüke. 1999. Orčin čagyn mongol helnij "neršsen" temdeg nerijn onclog (temdeglel). Mongol ulsyn ih surguulijn Mongol sudlalyn surguul' Erdem šinžilgeenij bičig XV bot', 13: 95–111. قالب:Mn icon Sanžaa, Ž. and D. Tujaa. 2001. Darhad ajalguuny urt egšgijg avialbaryn tövšind sudalsan n'. Mongol hel šinžlel, 4: 33–50. (بالروسية) Sanžeev, G. D. 1953. Sravnitel'naja grammatika mongol'skih jazykov. Moskva: Akademija Nauk USSR. قالب:Mn icon Sečen. 2004. Odu üy-e-yin mongγul bičig-ün kelen-ü üge bütügekü daγaburi-yin sudulul. Kökeqota: ÖMASKKQ. ISBN 7-5311-4963-X. Sechenbaatar [Sečenbaγatur], Borjigin. 2003. The Chakhar dialect of Mongol: a morphological description. Helsinki: Finno-Ugrian society. ISBN 952-5150-68-2. قالب:Mn icon Sečenbaγatur, Qasgerel, Tuyaγ-a [Туяa], Bu. Jirannige, Wu Yingzhe, Činggeltei. 2005. Mongγul kelen-ü nutuγ-un ayalγun-u sinǰilel-ün uduridqal [A guide to the regional dialects of Mongolian]. Kökeqota: ÖMAKQ. ISBN 7-204-07621-4. (صينية) Siqinchaoketu [=Sečenčoγtu]. 1999). Kangjiayu yanjiu. Shanghai: Shanghai Yuandong Chubanshe. Slater, Keith. 2003. A grammar of Mangghuer. London: RoutledgeCurzon. ISBN 978-0-7007-1471-1. Starostin, Sergei A., Anna V. Dybo, and Oleg A. Mudrak. 2003. Etymological Dictionary of the Altaic Languages, 3 volumes. Leiden: Brill. ISBN 90-04-13153-1. Street, John C. 1957. The language of the Secret History of the Mongols. New Haven: American Oriental Society. American Oriental series; 42. Street, John C. 2008. Middle Mongolian Past-tense -BA in the Secret History. Journal of the American Oriental Society 128 (3): 399–422. Svantesson, Jan-Olof. 2003. Khalkha. In Janhunen 2003: 154–176. Svantesson, Jan-Olof, Anna Tsendina, Anastasia Karlsson, Vivan Franzén. 2005. The Phonology of Mongolian. New York: Oxford University Press. ISBN 0-19-926017-6. قالب:Mn icon Temürcereng, J̌. 2004. Mongγul kelen-ü üge-yin sang-un sudulul. Kökeqota: ÖMASKKQ. ISBN 7-5311-5893-0. قالب:Mn icon Toγtambayar, L. 2006. Mongγul kelen-ü kele ǰüiǰigsen yabuča-yin tuqai sudulul. Liyuuning-un ündüsüten-ü keblel-ün qoriy-a. ISBN 7-80722-206-9. قالب:Mn icon Tömörtogoo, D. 1992. Mongol helnij tüühen helzüj. Ulaanbaatar. قالب:Mn icon Tömörtogoo, D. 2002. Mongol dörvölžin üsegijn durashalyn sudalgaa. Ulaanbaatar: IAMS. ISBN 99929-56-24-0. قالب:Mn icon Tsedendamba, Ts., Sürengijn Möömöö (eds.). 1997. Orčin cagijn mongol hel. Ulaanbaatar. Tserenpil, D. and R. Kullmann. 2005. Mongolian grammar. Ulaanbaatar: Admon. ISBN 99929-0-445-3. قالب:Mn icon Tümenčečeg. 1990. Dumdadu ǰaγun-u mongγul kelen-ü toγačin ögülekü tölüb-ün kelberi-nügüd ba tegün-ü ularil kögǰil. Öbür mongγul-un yeke surγaγuli, 3: 102–120. Walker, Rachel. 1997. Mongolian stress, licensing, and factorial typology. Rutgers Optimality Archive, ROA-172. Yu, Wonsoo. 1991. A study of Mongolian negation. Ph. D. Thesis. Bloomington: Indiana University. Wikivoyage has a phrasebook for Mongolian.